China has rolled out an advanced facial recognition system over 16 provinces, cities and autonomous regions ominously called “SkyNet” for the “security and protection” of the country, reports Workers’ Daily. In the past two years, over 2,000 criminals at large were reportedly apprehended by public security cameras using the system – while officials tout a June 2017 rescue of a 6-year-old girl reported missing in northwest China’s Xinjiang Uygur Autonomous Region based on a photo taken several years ago. In January, Bloomberg reported that Beijing was using facial recognition to surveil Muslim-dominated villages on China’s western frontier, which alerts authorities when targeted individuals are more than 1,000 feet beyond designated “safe” areas. The areas comprise individuals’ homes and workplaces, said the person, who requested anonymity to speak to the media without authorization. 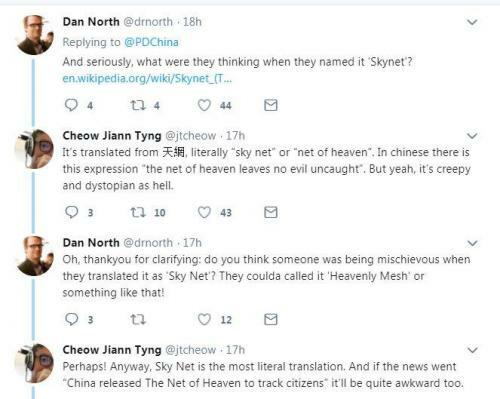 We’re sure the new facial recognition “SkyNet” will go hand in hand with China’s new “Social Credit Score” system set to launch in 2020. And as the Washington Post noted, the Chinese city of Chongqing has engaged in a pilot project called “sharp eyes,” which connects various cameras throughout the region in order to fight crime. The intent is to connect the security cameras that already scan roads, shopping malls and transport hubs with private cameras on compounds and buildings, and integrate them into one nationwide surveillance and data-sharing platform. Perhaps China could have named their new facial recognition system after something other than the dystopian AI-controlled national defense system that led to the end of civilization in the Terminator series. Then again, maybe that’s the point.